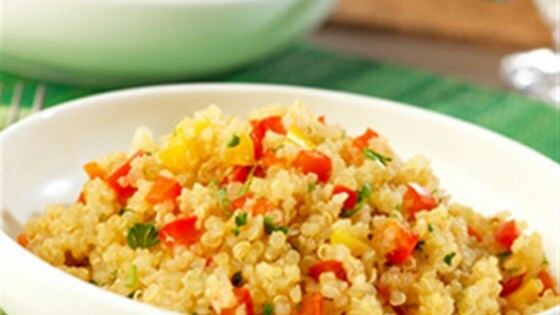 "Protein-packed quinoa is toasted, then cooked until tender with sweet peppers and garlic for a hearty side dish. You can serve this wholesome grain dish hot, at room temperature or even chilled--perfect for any season!" Heat the oil in a 2-quart saucepan over medium-high heat. Add the shallot and garlic and cook for 2 minutes, stirring occasionally. Add the peppers and quinoa and cook for 2 minutes, stirring occasionally. Stir in the broth and heat to a boil. Reduce the heat to low. Cover and cook for 20 minutes or until the quinoa is tender and the liquid is absorbed. Stir in the parsley. Season, if desired. A dressing recipe that is special enough for holidays or as an everyday side. Recipe Note: This dish can be served hot, at room temperature or chilled, according to your preference. Allstars are loyal Allrecipes community members, selected to be brand ambassadors based on onsite participation, interest, and commitment. Allstars may be compensated for their participation in the Allrecipes Allstar program. Followed recipe exactly. It was okay. I added some cheese and it was better. Simple, versatile, and delicious! Will definitely make again! Easy, quick and delicious. I added soffritto instead of shallot and used tri-color quinoa. Beautiful!